Are we going to get tears all over our Thanksgiving turkey? If this promo for This Is Us Season 1 Episode 8 is any indication, the answer is a definitive maybe. When William let slip he'd been in contact with Rebecca for decades, Beth went nuts. She couldn't imagine not sharing the truth with her husband. But it wasn't really her truth to share. Whatever the conversation between Beth and Rebecca, and how William may have played into that, it seems the whole thing is coming to a head at the Thanksgiving dinner table. You know what we don't like? Randall in tears. Randall in tears on a holiday seems just short of sacrilege. There has to be a way the can all pull out of this and come together, happier for being all together, even if it took years. In the promotional photos, despite the unpleasant conversation between Kate and Toby in the promo, Kate's on a plane. Does she make it to Jersey to spend the holiday with her family? Will the entire family have one another to lean upon? Kevin's taking a big step inviting Olivia over to Randall's for the holiday feast. There are some times when the phrase 'the more the merrier' just doesn't fit the occasion. But when the kids were eight, a simple trip to Rebecca's mom's for Thanksgiving is thrown up into the air by a flat tire. Still smiles and laughter abounds, and with as much as the stories in the past correlate to those in the present, I have high hopes the whole family comes out on top this year, too. Those tears I talked about earlier? What do you think...tears of joy while we watch this wonderful family and we all share our first Thanksgiving together? If you've missed any of this wonderful series so far, please watch This Is Us online. Get on board. 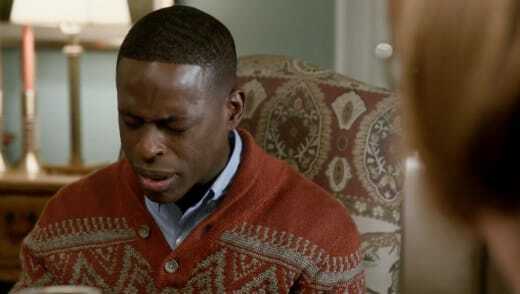 This Is Us Season 1 Episode 8: "Pilgrim Rick"
Jack: I always thought when my parents died, we'd get to do our own thing. Make up our own stupid traditions with the kids. Rebecca: That's because you're a very, very naive man. Permalink: That's because you're a very, very naive man.